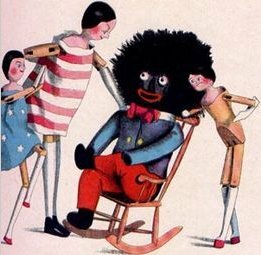 The Golliwog (originally spelled Golliwogg) normally has very dark, often jet black skin, large white-rimmed eyes, red or white clown lips, and wild, frizzy hair. Typically, it's a male dressed in a jacket, trousers, bow tie, and stand-up collar in a combination of red, white, blue, and occasionally yellow colors. The Golliwog image, popular in England and other European countries, is found on a variety of items, including postcards, jam jars, paperweights, brooches, wallets, perfume bottles, wooden puzzles, sheet music, wall paper, pottery, jewelry, greeting cards, clocks, and dolls.